It may not hold your fortune yet but this authentic looking vault bank may help get you started on the road to that fortune. Our vault bank makes saving fun when only you know the combination to your own vault! Turn the dial to the combination and then open the lever to access your savings. 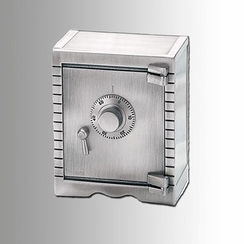 The vault bank is manufactured in a non tarnish, brushed pewter finish. Not only will kids love this bank but it also makes a great corporate gift. The coin slot is located on the back of the vault and there is plenty of possible engraving areas to use. The engraving (optional) area on the top of the vault is 3.5" x 2". Overall dimensions are 5" H x 2.5" W x 4" L.